U.S. equity index futures were lower this morning. S&P 500 futures were down 7 points in pre-opening comments. Investors are awaiting Federal Reserve Chairman Jerome Powell’s testimony on monetary policy to be made at 10:00 AM EST. The Canadian Dollar slipped US 0.13 to 78.76 cents prior to release of the Federal Government budget after the close today. 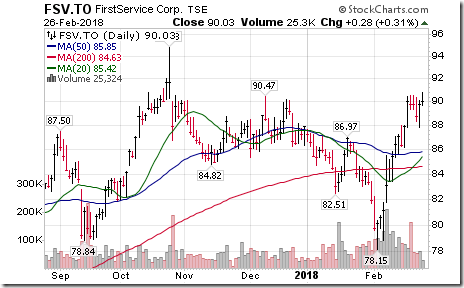 Bank of Nova Scotia (BNS $ $78.79) is expected to open higher after reporting higher than consensus fiscal first quarter earnings. Scotia Bank also raised its dividend. 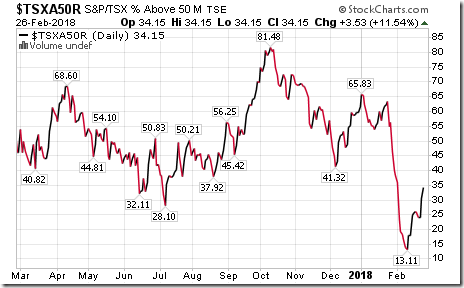 Bank of Montreal (BMO $99.58) is expected to open higher after reporting higher than consensus fiscal first quarter earnings. Nordstrom (JWN $52.40) is expected to open higher on a new report that the company will go private. Macy’s gained $2.46 to $29.91 after releasing higher than consensus fourth quarter sales and earnings. 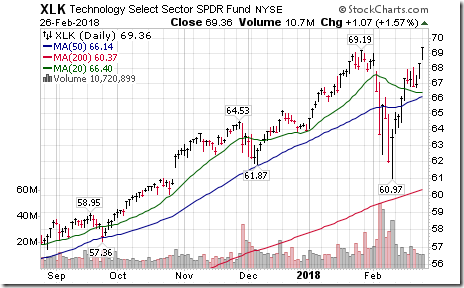 Note seasonality charts on the Technology sector, New Home Sales and Margin Debt. Technical action by S&P 500 stocks to 10:45: Quietly bullish. Breakouts: $NFLX $MA $MU $DUK. 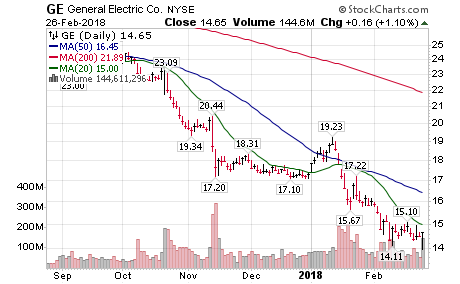 Breakdown: $GE. Editor’s Note: After 10:45 AM EST, breakouts included AXP, EMN, AME and CBG. No breakdowns. 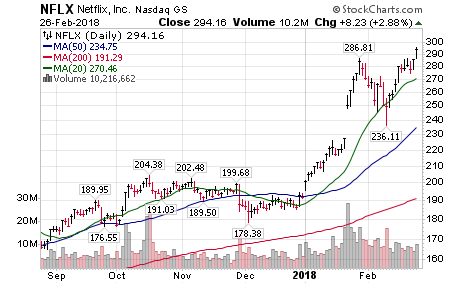 Netflix $NFLX, one of the FAANG stocks moved above $286.81 to all-time high extending an intermediate uptrend. 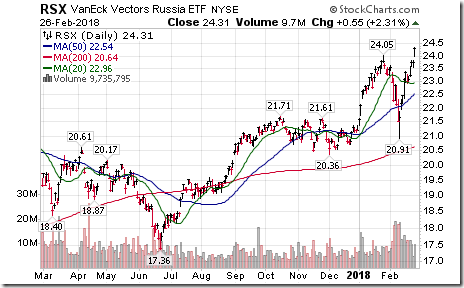 Russian ETF $RSX moved above $24.05 to a 4 year high extending an intermediate uptrend. Enerplus $ERF.CA moved above $14.53 and $14.68 completing a long term reverse Head & Shoulders pattern. 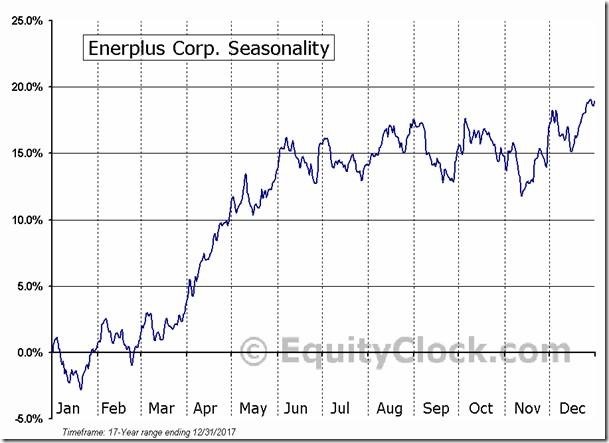 ‘Tis the season for Enerplus $ERF to move higher to early June! 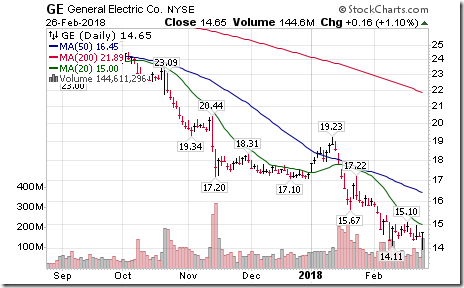 General Electric $GE, a Dow Jones Industrial stock moved below $14.11 to a 6 year low extending an intermediate downtrend. 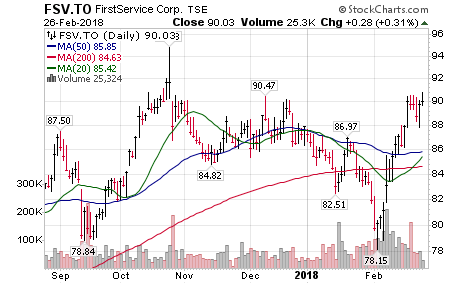 First Service Corp $FSV.CA moved above $90.47 extending an intermediate uptrend. 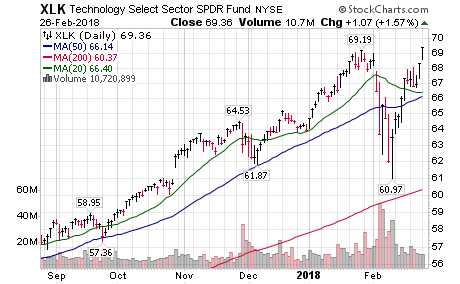 Technology SPDRs $XLK moved above $69.19 to an all-time high extending an intermediate uptrend. Sometimes, the market moves because people believe it will move, thus creating a self-fulfilling prophesy! The Barometer added another 4.20 to 55.60 yesterday. 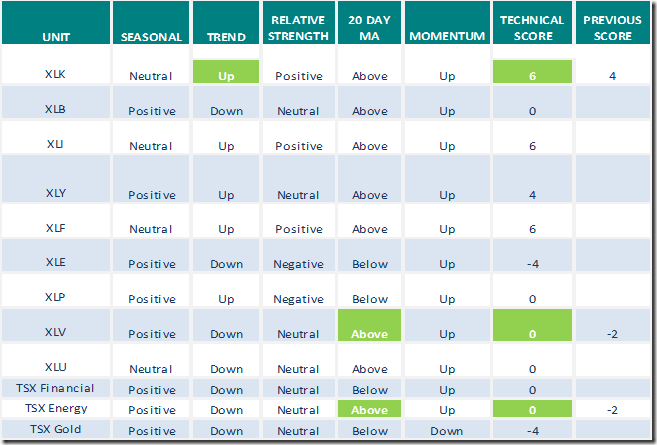 It continues to trend higher and is slightly intermediate overbought. The Barometer advanced another 3.53 to 34.15 yesterday. 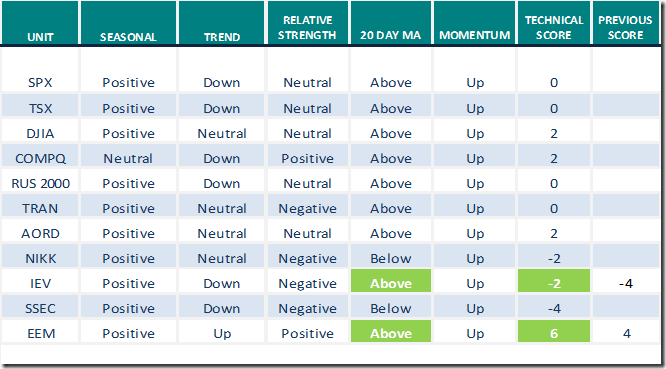 It continues to trend higher, but remains intermediate oversold. $CAD dropping decisively below 200 day MA. I don’t think it will find support until around 77.50. 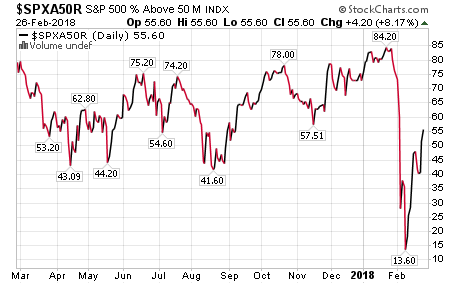 New Highs US Banks – BAC new high, KRE (regional bank index) new high, MS – tagged previous high. Banks hitting new highs despite down market indices. 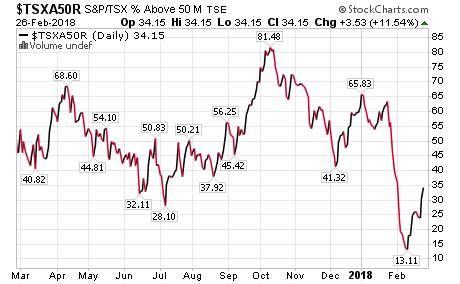 Looking for your TA and thoughts on holding $CAD versus $US going forward. I have some cash in another currency and am looking to convert back to CAD or USD and then hold in a GIC or something of the sort for now. Which would you rather hold onto at this point CAD or USD ? Also, since the USD has picked up a bit in the past few days, I’m wondering if its wise to convert the USD I hold into CAD as well. The U.S.10 year Yield Index appeared to be pulling back last week and was overbought. That didn’t last long as Monday and so far today the yield is rising sharply once again rising to the highest level since late 2013. The 3% level is being closely watched to suggest this multi decade downtrend has ended without question. Today’s high so far is 2.94%. Budget Day today in Ottawa and the new U.S.Fed chief will be talking finance today. Best to keep that in mind before you push the ‘buy’ button. TD.to is hitting a new all time high today, reports on thursday. I expect this is anticipation of good earnings and a possible dividend hike. It is also the only cdn bank to hit a new high after the selloff at the beg of the month. Was lucky enough to pick up some shares when it dropped below $70, will see what happens in a few days. The CD$ has been a choppy basket case for some time now. It has not done well against the U.S.$ that has fallen for over a year now. The CD$ has also been underperforming $WTIC for some time now. CD$ price recently broke below 79 short term support as well as broke its its uptrendline from last May. As long as price is below 79 the chart suggests a pullback to 77 cents. CD Budget Day today as well as the new U.S. head of the Federal Reserve to talk finance today so things might be somewhat clearer on currency direction this week. But to date the CD$ chart below 79 is bearish. Lots of bullish and bearish comments on the CD$. If commodities rally consistently along with Crude etc then the CD$ ‘should’ do better. But with the CD Government raising business taxes and increasing regulations and the U.S. doing the opposite by drastically cutting taxes for business and the public plus slashing regulation it’s obvious where business is going to go. I will always hold a chunk of U.S.$ in one of my accounts. Too bad there weren’t German Marks still available. I’d hold some of those if there were But not Euros. 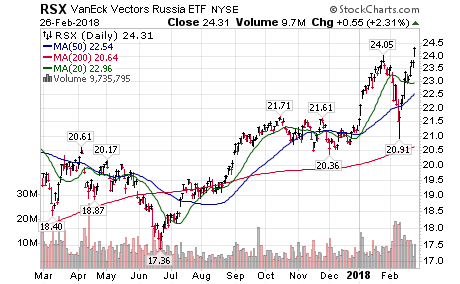 Here is a basic scan that you can put in the ‘Advanced Scan’ in stock charts to get some etfs. You can change the volume here and the sma value, price etc without having to add additional indicators. To add an indicator, just choose from the lists and click the ADD button, it will add to the bottom of this scan, once it is in the scan window you can change the values. ensure you click on ‘check syntax’ before running to ensure your code is ok. If you like the scan then save it under whatever name you choose. 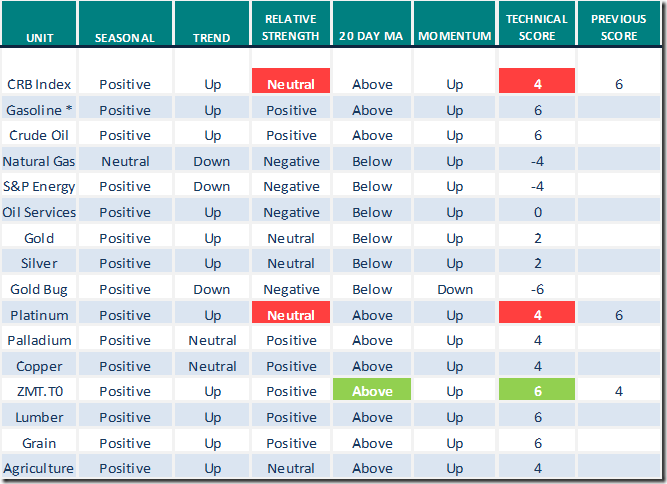 cnr.to which has been beaten up since the beg of the year has nicely recovered from its oversold position in feb and this morning moved above the main pivot point resistance. 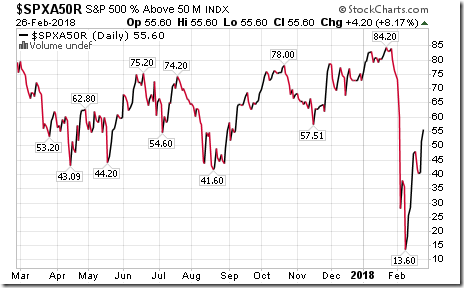 The stock is still down a little over 2% ytd, but if this level can hold, it may run up to the $103/$104 area before pulling back again. Have owned this one for awhile, it has been a good hold. The stock yields about 1.6%, not a lot, but it has increased its dividend each year for the past 20+, I expect that to continue. Thanks for the Scan info. I did get a selection of 99 ETFs. Trying to figure out how to fine tune the indicators etc. I chose MACD signal for instance but don’t know what that will give me. Same with PMO signal. Not sure what it’s using to determine that up or down. But it’s a start. I’ll have to read all the instructions etc to get a good handle on it,thanks again. I’ve never used the Advanced Scan before and just stuck to the Standard Scan. Fed Chair Powell sounds like he is in grade seven compared to Janet Yellen! All of you skeptics about her control of the markets! It is a chuck wagon without the driver steering! We are in for a wild ride. Hold on tight. With the PMO and MACD signals, I think you need to compare them, something like below. Yes, it may be easier to start in the standard scan. Stockcharts has adjusted their scans with the recent upgrade, not really impressed, at least the previous scans still work although with moving over to TD’s advanced dashboard, their scans are adequate for what I need and I get free real time data for the U.S. and Cdn markets which is really nice, even tried out the level 2 quotes for a month, the fee was waved, since I am not a trader, level 2 wasn’t necessary, but it was interesting . Or just maybe Janet Yellen left everything in such a mess, I feel bad for this new Fed Chair. Janet seemed to smooth everything out. This guy is getting raked over the coals. That 4% looks like a great investment however I am really surprised you consider investing in a Credit Union. You will also benefit from the shares from the funds you invest in a Credit Union. You might be a closet socialist! Forming a Head and Shoulders. I think I prefer the Standard Scan as it seems to be more user friendly at least from what I presently know and understand. I can fine tune what I want to see come up better with it. Too bad a person couldn’t just tell it what you wish to program. I do but it doesn’t understand “rant”. I have always dealt with a Credit Union as well as a couple of Banks. The Credit Union always gave me a better deal when I had a mortgage and were more flexible. Plus a Credit Union guarantees ALL your money by the B.C. Government unlike the Canadian banks that guarantee up to $100,000 though CDIC. And just how long would CDIC last in a major financial crisis? Not long. And no I’m not a Socialist. I don’t lean far enough to the left for that sort of “control society” mentality that left leaning people have. I like to think we can all have various opinions both left and right of center that are legal and express them with both sides considering the comments. 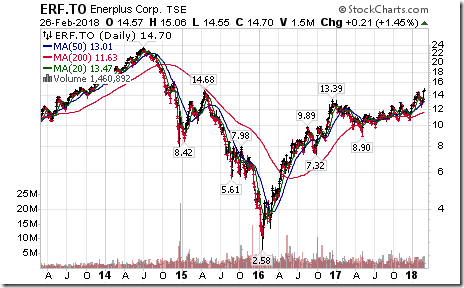 anyone here know if Canadian Western Bank is a schedule 1 bank like the big 4? Head and Shoulder Pattern has just broken the shoulder line. Ron/BC: Thanks for your posts yesterday. Always learn something new from them. 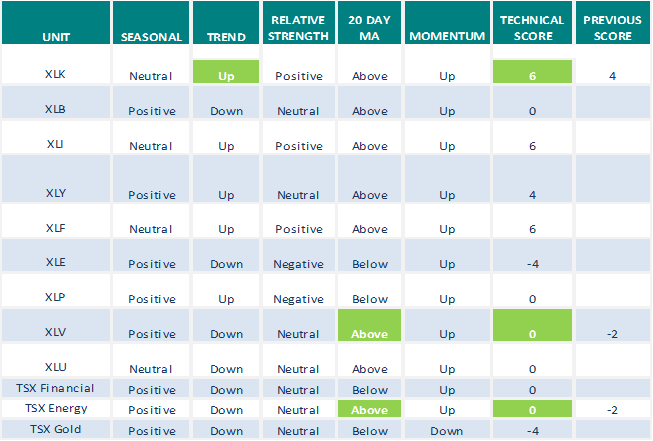 The percentage of stocks above their 50 day moving average doesn’t seem to have improved much with the rally back. Same thing with the percentage of stocks above their 200 day moving average. The puppy isn’t as healthy as it should be. 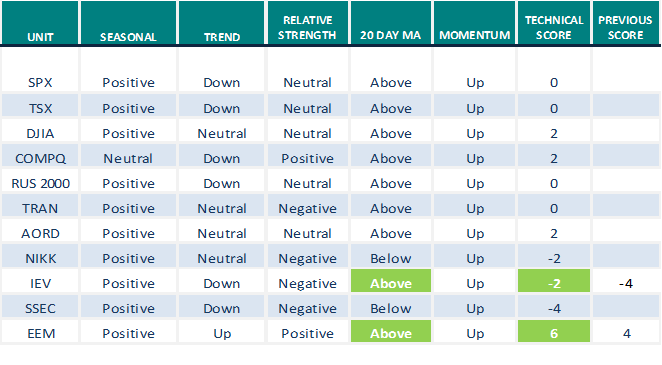 Even stocks above their 20 day moving average is low for the rally back. 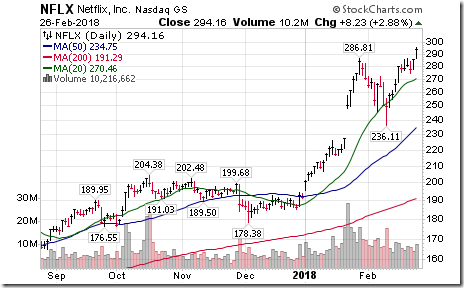 Shouldn’t the 20 day ma show on the chart you posted, it currently shows 10 ma? Similar with the other charts or am i missing the interpretation? Ron/BC: what do you think of Gold has pulled back and is approaching support at 1310. I like AEM.TO. Where do you see support? I am thinking the chart is showing to your default chart? I originally got those settings from a site I used to subscribe to that studied and reported on the internal breadth indicators. 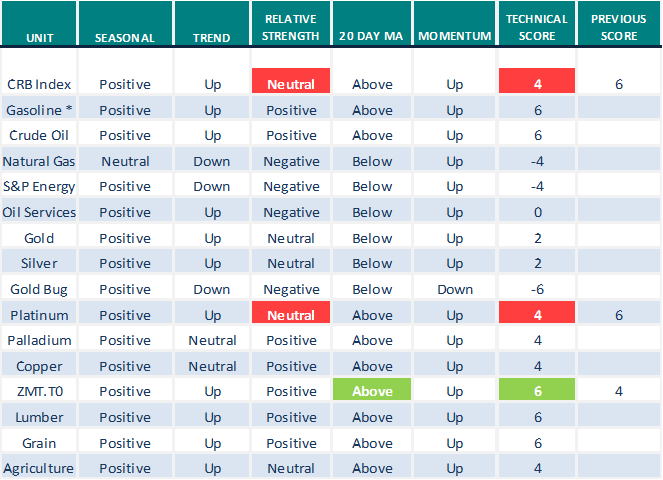 Notice in the “TYPE” I have Invisible and have used a SMA 10 to show the 10 day average of the % of stocks above the 50ema and the other two as well,rather than just the raw data. The one with the EMA 5 was wrong as you pointed out. So you don’t need a moving average across the chart. Those breadth charts were for the NYSE on the 50 and 200 and the $Spx on the 20. Here are the 3 $SPX charts with the raw data on them solid line. It’s choppier than smoothing the data out with a moving average but you can see all the movement with raw data that you wouldn’t see smoothing it out with a SMA. Lots of ways to view this of course and smoothing out the data is often better to see the trend. As of February 28th, 2018 UVXY will target 1.5 leverage instead of 2X. This change was in response to the events of February 5th, 2018 when a massive VIX futures spike occurred in the last 30 minutes of trading, probably in part due to the rebalancing required by the 2X UVXY and -1X SVXY funds. This change to UVXY will reduce its rebalancing requirements and make it less susceptible to a termination event if VIX futures were to fall 50% or more from the previous day’s close. This leverage change will reduce UVXY’s tracking to the VIX index and reduce its decay rate somewhat.